Cartier’s Tank watch design has evolved since its initial release in 1917, but the inspiration of the allied forces of Europe is still evident in the structure and appearance of the metal bracelet. Today, the Cartier Tank Francaise W51011Q3 watch is a sleek, modern timepiece with elements of history and classicism. The primary material of the Cartier Tank Francaise W51011Q3 watch is steel, incorporated into the case, bracelet, crown, and even the sword-shaped blue steel hands, yet another nod to its army inspiration. The face features sapphire crystal and a silver grained dial. The numbers are printed around the edges in Roman numerals that stretch and lean towards the 6 and 12, or VI and XII, poles. The style of the watch is crisp and classical; there are no superfluous elements or additional functions. The face is an unobstructed white with the rectangular numbers and markings. The only additional feature is the date in the place of the 3. The Cartier logo is on the face just above the pivot of the hands. The hands of the watch and the spinel cabochon tip of the crown are both a navy blue. The Tank Française Watch W51012Q4 is similar to the W51011Q3 model except that its bracelet and octagonal crown feature 18k yellow gold and steel, adding a pop of bright color and complementing the blues. There are large, medium, and small models for the aforementioned Tank styles. The Tank Française WE100253 is a small model timepiece that is a glittering version of the Tank Française watch with its 18k white gold and round cut diamonds along the length of the watch face and on the crown. 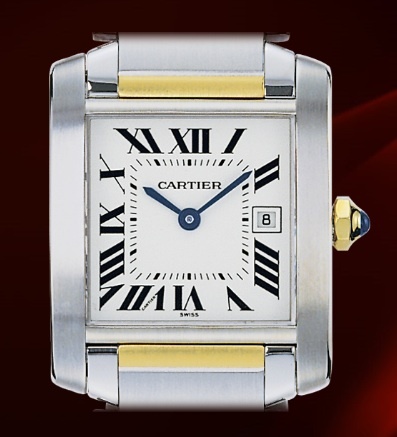 Cartier’s Tank watch line was first designed to have the links of the bracelet recall the powerful, tracked vehicles used by the allied troops in World War I. The Tank collection now features watches with various strap choices, but the Française line is one of the few lines of the collection that maintains the traditional inspiration with the metal linked bracelet. 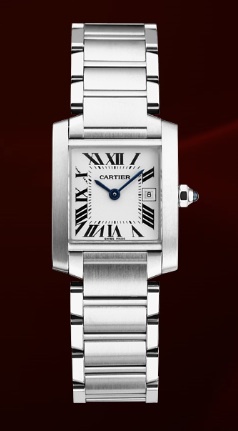 The Cartier Tank Française Steel Watch W51011Q3 is a sleek, narrow, classically inspired timepiece that hearkens back to the aesthetics of the Romans with its numbering and clean, architectural style. 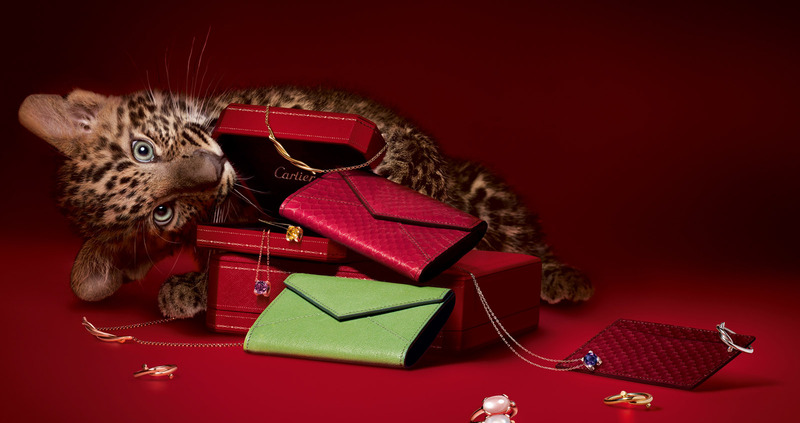 As a Cartier product, it is a significant investment in a watch, piece of jewelry, and label.